Restaurant chicken tikka masala is one of the most popular Indian restaurant dish going. Creamy. A little bit sweet. A little bit savory. It has something going on for everyone. I think it’s funny that restaurant chicken tikka masala isn’t an Indian dish at all. It was invented in the UK some time in the early 1970s. The best story around this dish is that it was invented in Glasgow when a bus driver complained that his curry wasn’t saucy enough. The chef, who was eating tomato soup at the time, tossed some of his soup in the curry and sent it back out to the bus driver. The rest is history. There’s no tomato soup in this recipe. Please don’t do that. I know there are recipes out there that use tomato soup, garam masala and cream. That’s Indian spiced cream of tomato soup with chicken. I know that’s how the story goes but it has evolved. Improved. If your local Indian restaurant is still serving something that tastes like soup it’s time to find a new restaurant. It’s a mild curry. One suitable for the most timid palates. You can make restaurant style chicken tikka masala for your kids. Or as a counterpoint to spicier dishes. It’s a crowd pleaser for sure. Layering flavours is key. The chicken is first cooked in tandoori spice and then finished in a tomato cream sauce. Hints of coconut and almond and a bit of sugar round it out. 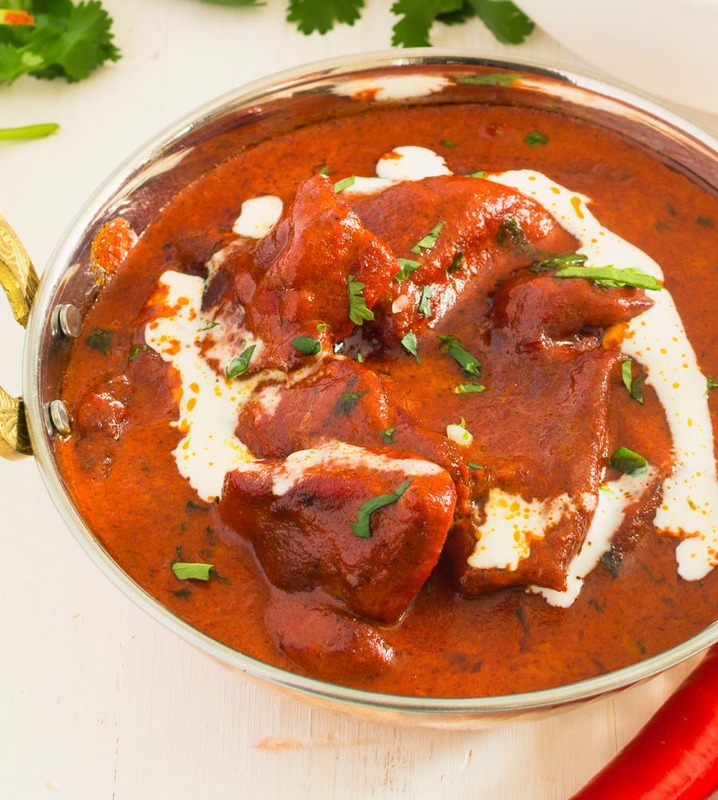 This chicken tikka masala is pretty straightforward and follows the Indian restaurant technique exactly. Do yourself a favour and read that post first. There are pictures to help you understand. Prep your ingredient. Make your curry base and have some heated and ready to go. Pre-cook your meat. Measure out your ingredients. Put on some old clothes – the curry sputters. Try this one if you always order chicken tikka masala in restaurants. Or if you are just getting into learning Indian restaurant cooking. Or if you just want a nice mild but still tasty curry. It’s a great place to start. 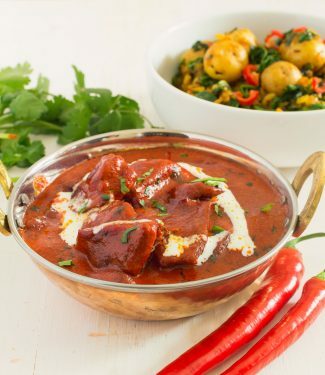 Restaurant chicken tikka masala is a mild, tangy curry with a hint of coconut and almond. Combine 2 Tbsp tandoori masala powder, 1/2 tsp salt and 3-4 Tbsp vegetable oil in a bowl that won't stain. Cut the chicken into big bite size pieces and combine with marinade. Let stand briefly.- or up to 4 hours in the refrigerator. Transfer chicken to a sturdy cookie sheet and roast until it reaches an internal temperature of about 165F, about 15 minutes. Combine Indian restaurant spice mix powder, tandoori masala and salt in a small bowl. This is your spice mix. Combine the almond and coconut powder with enough water to get to the texture of coconut milk or heavy cream. Heat your frying pan (don't use non-stick) briefly over medium heat. Add 3 Tbsp vegetable oil. Use all the oil specified. It's important. When the oil starts to shimmer add the garlic ginger paste. Cook it, stirring constantly, until it stops sputtering. Add the rest of the curry base and let cook until the bubbles form. Turn the heat down to low and add the pre-cooked chicken, coconut almond mixture and sugar. Add the cream and stir. Mix in the lemon juice, garnish with a bit of chopped fresh coriander if you like and serve. Tandoori masala powder is available in any Indian grocery. I don’t even want to admit right now that I thought I’d made this before. After reading your recipe, and already knowing that you are THE expert in curry/meat EVERYTHING, I know this is the recipe I’ve got to do to get it right. Recipe by recipe, you are educating the midwest/me haha. Thank you! I’d take a lesson in Kansas City BBQ as a trade any day:-) I’m so glad you are learning from my posts. That’s why I do it! Wow! This is amazing! I’ve been on a “quest” to duplicate my favorite restaurant chicken tikka masala (Mela in SF), and this is really close! Mela’s has a bit more buttery mouth-feel and a deeper tomato “layer.” But this is the closest I’ve ever come to ANY restaurant tikka masala! AWESOME. AND…thanks for the HOW to cook it. That seems half the challenge! I do have a few questions: a.) I couldn’t find “coconut powder” but I did find “coconut flour”. Is that the same thing? I had a difficult time getting the almond/coconut to become a “creamy” consistency….more like oatmeal. b.) do you ever use ghee in this? I was wanting more buttery/fatty taste and c.) is there a way to up the tomato flavor layer? These are all novice questions from someone who doesn’t know what he’s doing!!! I just found your website and am loving it! There’s so much more for me to explore here! You are absolutely right – if you want more buttery use ghee instead of vegetable oil. It will be richer and perhaps the flavours will be a bit muted but the buttery taste will be there for sure. Maybe start half ghee, half oil and go from there. This sounds great thank you! I’ve tried twice to make chicken tikka masala but had no idea there was a base!! The last time I tried to make tikka masala, it tasted bitter for some reason. Is this because I burnt the spices? Thanks again for this, I will definitely be trying when my new blender arrives! Bitter sounds like burnt spices. Be careful at that stage. I find adding peppers and carrots to base tends to make my curries all taste like carrots and peppers. I prefer to keep the base simple and let the individual recipes shine through. Good luck! Hi, can’t wait to try this chicken tikka masala recipe. I am a little confused, the only place I see curry powder is in the Indian restaurant spice mix but for the chicken tikka masala instructions, you say to “mix the curry powder, tandoori masala and salt in a bowl, this is your spice mix”? Further on in the instructions it says to add the spice mix,maybe I’m reading it wrong, but could you clarify this for me. Laurence. I’ve clarified the recipe. Hope you enjoy the it. How do you make the tomato paste please. I’m guessing you are in the UK? If so it’s called tomato puree and comes in tubes or small tins. You don’t make it (although I suppose you could). Rather you buy it. Doubling these restaurant style curries doesn’t work well unless you have a really big pan and high heat. You need the curry base to caramelize. Best to make it in two batches and keep the first batch warm while you make the second one. If you can’t get the coconut powder I would guess about 1/4 cup of coconut milk per batch would work out. Thank you. I have made the Dopiaza and the madras this week. Amazing. My 30 year search for a decent home made curry is over. X can I also ask is TAndoori masala curry spice mix, the same as tandoori spice mix. So glad to hear they are working out for you! Tandoori masala is the tandoori spice mix from the Indian shops. It says tandoori masala on the container where I am. I’m pretty sure it is the same thing as tandoori spice mix. It’s not just the UK. The British style curry is big in North America. 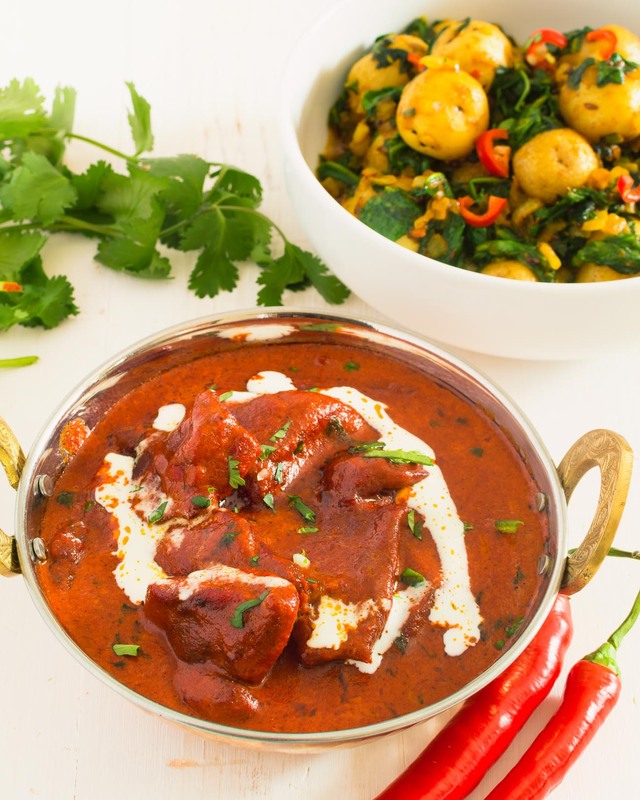 The technique actually adapts pretty well to more authentic spiced curries. I will get around to posting some of my hybrid recipes soon. Hope you like my take on CTM.